Position signals sent on the 868MHz band are weak: they are only 10mW and the transmitting antennas are simple 1/4 wave sticks installed "somewhere" in the glider, that means their placement is hardly ever optimal for achieving best range. Reception antenna, that picks up the signal is the most important and often neglected element in a radio system. Thus think well about this element: make it to have best gain possible with given space and budget and place it, where it can see the complete horizon with no obstacles in the way. Receiving ADS-B is very popular these days. To compare: our signals are 1000 to 10000 (30-40dB) weaker in power, we gain a bit on the data rate which is 20 times slower (50kbps) than ADS-B (1Mbps) but in total we are still a factor of 100-1000 worse. Gliders fly lower than airliners thus antenna height and obstacles count much more. 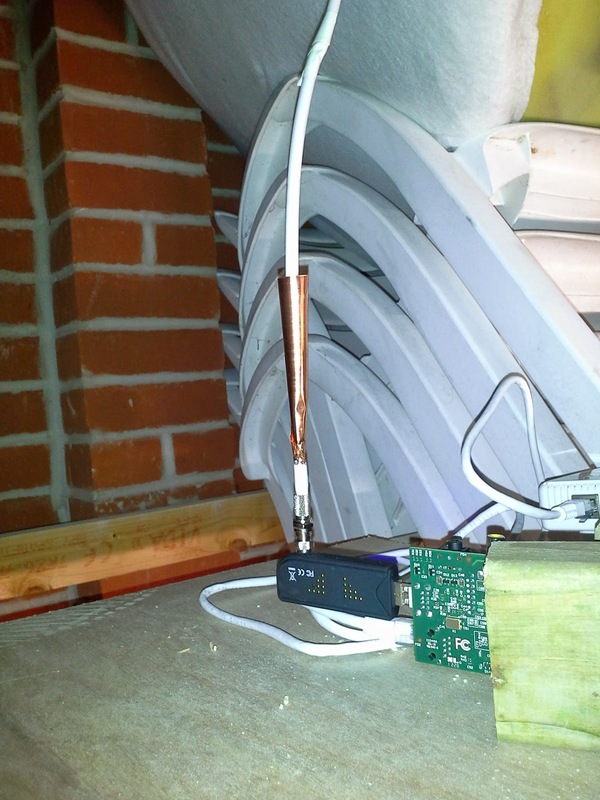 You can either purchase a ready-to-use antenna (recommended) or make one yourself. Build your own high performance antenna by Pawel. Describes in details howto build an antenna with a very good performance for your base station. ADS-B Antenna build - Yet another good one (for ADS-B) - can be used as a hint. Search on google for keywords like "collinear antenna coax homemade" to find more information. Photo of a foil cone here. 10mm section of coax outer stripped back at base of cone location and 0.1mm craft cu foil cone soldered to braid. Remaining (short) coax is then terminated in a twist on F-plug, F to MCX adaptor. In May 2014 we organized the first bulk order of 9dB collinear antennas from China. These antennas proof to perform very well and come for a very reasonable price! Huahong Communication (HK) Co., Ltd.
Alternatively, this antenna can be bought at Ülis Segelflugbedarf . No M.O.Q. Shipping from Germany. If you have a long run of coaxial cable with high losses, then , you may consider this antenna, designed by radio amateurs F1OPA and F5ANN, and manufactured with professional standards. This antenna is an adaptation to FLARM frequency of their widely used ADS-B active antenna ( more than 500 antennas installed world wide). This antenna support up to 18 dB of cable losses, without degradation of performances, and the low Noise Figure increase by more than 2dB the sensitivity of SDR dongle. active diapason antenna by F5ANN Design of ADS-B active diapason antenna. Same design but SAW filter and dipole size for FLARM. WiMo 868MHz Antenna The "868MHz Sperrtopf-Antenne" is well suited for rough outdoor use. Antenna 900MHz 8dBi Omni-Directional W/ N-Female. WiFi. Pole-Mount. GSM, WiFi works well. Terra AB010 - works well for OGN stations. It features a weather-proof enclosure, which can be mounted right below the antenna. Be careful: the AB010L has got a filter which makes the preamp useless for OGN. The AB011 has got a bigger gain which may useful for extreme long cables. The preamp requires F-connectors. Available via EBay. HAB-FPA868 - filter + preamp combination. The case is not water proof. Depending on your RF environment your OGN-station may receive lots of unwanted signals coming from radio amateur stations, TV broadcast towers, TETRA stations, …. To reduce the effect of these unwanted signals and to improve your OGN reception you can use a filter. Wevercomm WVC-881.5B-25M04. This is a high quality cavity filter with very low insertion losses. You may need some length of coax cable to bring the signal down from the antenna. Note that at 868MHz cable introduce significant attenuation: for example thin RG174 attenuates 1dB/1metre, thicker H-155, RF 5 or Aircell-5 0.2dB/metre. Plan your coax to be as short as possible, ideally put the receiver right at the antenna bottom. Coaxial cables data may help you choose the correct cable (e.g. with acceptable attenuation) for your installation. This site can also help you to do a quick comparison. Usually your antenna will come with N (female) connector. You'd need a converter to connect it to the DVB-T dongle. To make the radio signal readable to the computer and available for digital processing we use cheap SDR radios made from DVB-T USB dongles. They cost about $10 and are easily available on e-bay or from other sources. From our experiences the dongles based on the R820T tuner work best on 868MHz but for example EDMC receiver is running on a E4000 dongle and has a great range ! To find quickest your dongle you may type "R802T" into e-bay or a search engine. If you have already got such dongles give them a try ! To Run the OGN receiver you'll need some kind of computer running Linux. This can be a regular desktop PC or server, but by far the most popular option is to use a small Single Board Computer (SBC) like the popular Raspberry PI. These small devices are very energy efficient (using < 5 W), and can be placed close to the antenna, minimising cable losses. They are cheap and easy to install, even without any experience. Other brands of computer boards are also available, a comparison can be found in the links below. For desktop PCs, performance is not an issue. A Pentium 4 or comparable system should easily be powerful enough to run the OGN receiver among other tasks. This is today an easiest and fastest option if you have a Raspberry Pi (2/3). Simply download the image, write it to a SD card, insert into your Pi and (with very little configuration) you are ready to go! Recommended if you have hardware other than Pi(2/3). Requires a little bit of linux computer skills, but there are some guidelines available which will be helpful.